As I shared with you earlier this week, I did a recipe feature for the minibar section of sisterMAG’s no.8 issue. This recipe was adapted from a Martha Stewart recipe that caught my fancy and was the reason that I hunted out 8 complimentary jars which I blogged about the post before last. For those of you who don’t know, gelée is another way of saying jelly – a gelled suspension made for culinary purposes. Oh la la, sounds a little more fancy! 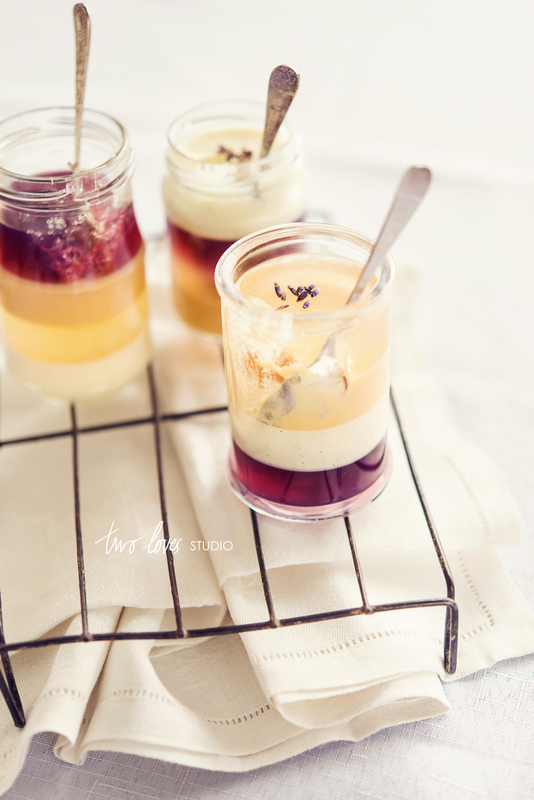 I am now sharing a few of my favourite pics from the shoot and the recipe. Make sure you head over to sisterMAG and check it their latest edition and you can even read it in German if you wish! 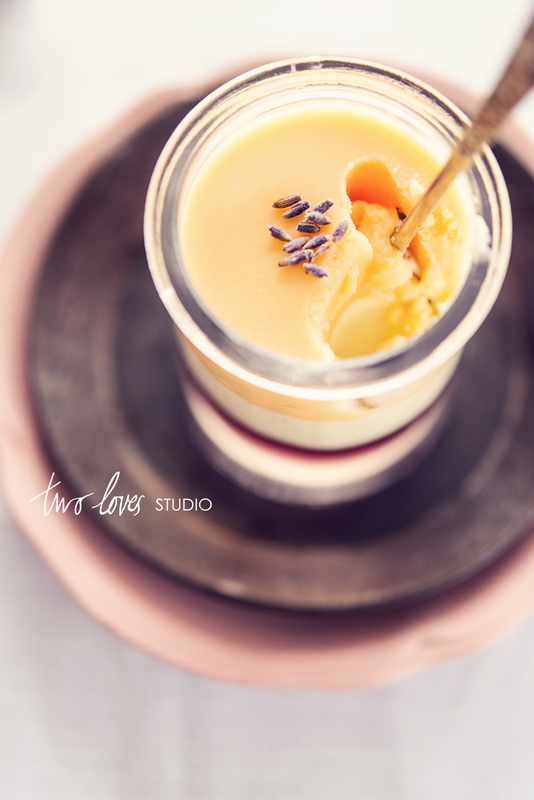 The flavours I used for the gelée layers are Vanilla Bean, Orange Cream, Lavender Blueberry and Lemon Squash. Lemon Squash is real lemonade to most of the rest of the world! Get inspired – create your own flavours. As you can see I used different sized and shaped jars to present the gelée in. Now those jars you have been stashing for months will come in handy! Before you scroll down to the recipe, just…..take a nice deep breath and enjoy the view. The recipe directions are a little long, but I have really laid it all out for you so you get it right first go. The recipe I looked at sent me on such a bum steer, that I pretty much rewrote the entire thing and had to change the quantities. 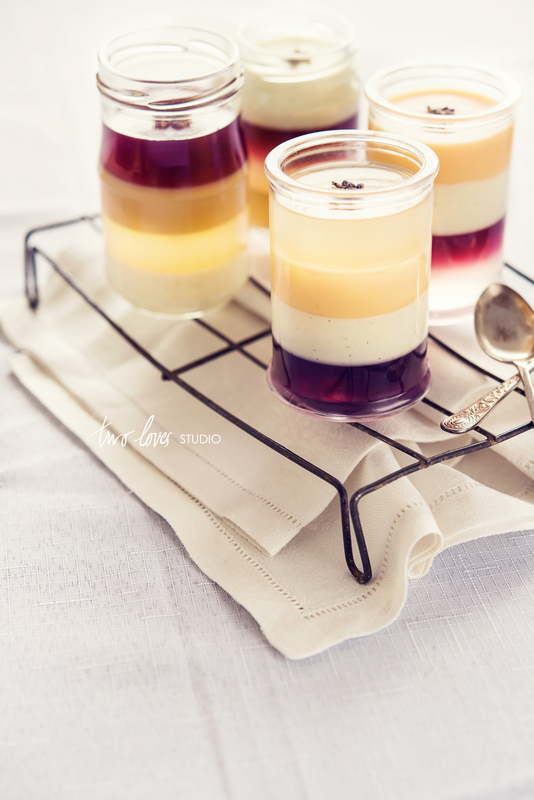 If we get down to it, its flavoured layered jelly – just a little more adventurous. Know the gelatin you are using and how much liquid it requires to set and you will be home and hosed. This can be done ahead of time and refrigerated in separate containers for up to a day before making the gelée. Start with the Vanilla Bean base. Halve the vanilla bean and scrap out the seeds. In a medium saucepan, combine the vanilla bean, seeds, cream and sugar. Heat on a medium heat until sugar is dissolved and the mixture begins to simmer. Simmer for a minute, remove from the heat and cover. Let infuse for 30 minutes with vanilla bean. Move onto the Lavender Blueberry base. In a medium saucepan, combine the water, sugar, blueberries and culinary lavender. Bring to the boil and simmer for 5 minutes. Remove from heat and cover. Let infuse for the remaining time of the vanilla bean. Whilst the Vanilla Bean and Lavender Blueberry are infusing, make the Orange Cream and Lemon Squash bases. For the Orange Cream base, combine the orange juice and cream in a medium saucepan. Heat on medium heat until the mixture starts to simmer. Remove from heat and cover. For the Lemon Squash, heat the lemon squash in a medium saucepan and bring to the boil to remove the fizz. Remove from heat and cover. After the Vanilla Bean has been infusing for 30 minutes, take out the vanilla bean and discard. Cover and reserve the base. Using a potato masher, mash the blueberries then strain the mixture using a fine sieve, discarding the blueberries and lavender pulp. Cover and reserve the base. 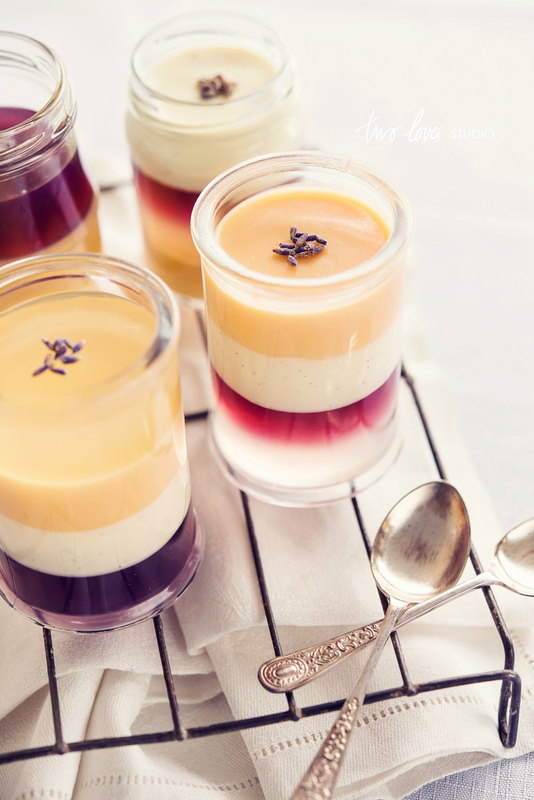 (If you are making this ahead of time, keep each base in a separate air tight container and refrigerate for up to 24 hours before making the gelee). Once you have made each gelée, you can transfer it to a jar or jug so you can use the one saucepan. Keep all gelée liquids warm. If it is a warm day then room temperature is fine, otherwise sit the jars in a small amount of hot (not boiling) water. (If the gelée mixture sets, you can reheat it slowly over a low heat until liquid again). Vanilla Bean Gelée. In a medium saucepan, heat ½ cup of the vanilla bean base on medium heat and add gelatin. Stir until combined. Once combined, add the remainder of the vanilla bean base and stir until combined. Remove from heat and cover. 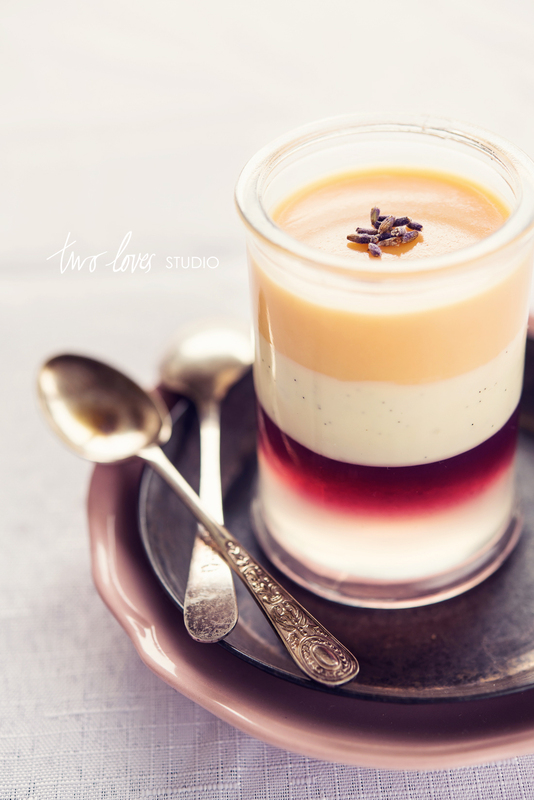 Lavender Blueberry Gelée. In a medium saucepan, heat ½ cup of the lavender blueberry base on medium heat and add gelatin. Stir until combined. Once combined, add the remainder of the lavender blueberry base and stir until combined. Remove from heat and cover. Orange Cream Gelée. In a medium saucepan, heat ½ cup of the orange blueberry base on medium heat and add gelatin. Stir until combined. Once combined, add the remainder of the orange cream base and stir until combined. Remove from the heat and cover. Lemon Squash Gelée. In a medium saucepan, heat ½ cup of the lemon squash base on medium heat and add gelatin. Stir until combined. Once combined, add the remainder of the lemon squash base and stir until combined. Remove from the heat and cover. Lay out your 8 washed jars. Fill two jars a ¼ of the way with the vanilla bean gelée liquid. 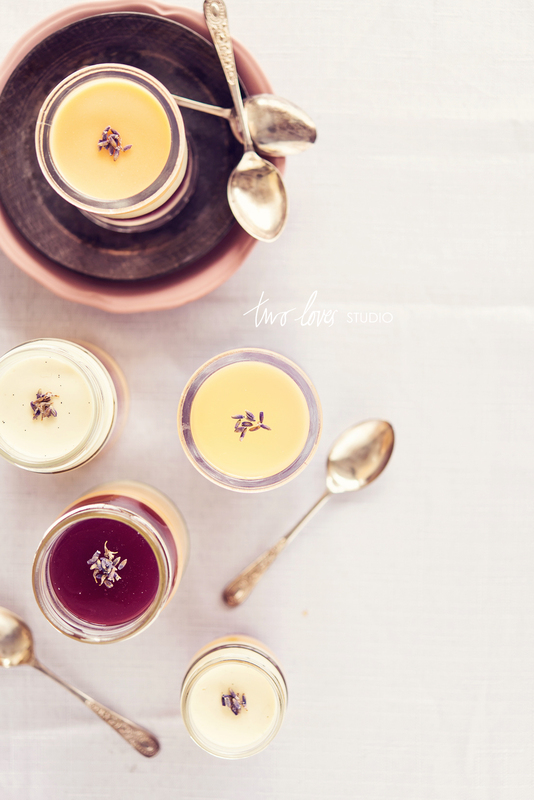 Fill two jars a ¼ of the way with the lavender blueberry gelée liquid. Fill two jars a ¼ of the way with the orange cream gelée liquid. Fill the remaining jars ¼ of the way with the lemon squash gelée liquid. Place in the freezer for 15 minutes until gelée has set. (Setting them in the freezer quickens the setting time, so we can pour on the next layer in less time and not worry about reheating the gelée liquid). Remove from freezer after 15 minutes and once set. Pour on the next layer of gelée liquid as outlined above, alternating the flavours of gelée liquid to create the layered effect. Place in the freezer for 15 minutes between each layer to set the newly poured layer. The last layer can be set in the fridge. The gelée keeps for up to three days in the fridge covered. 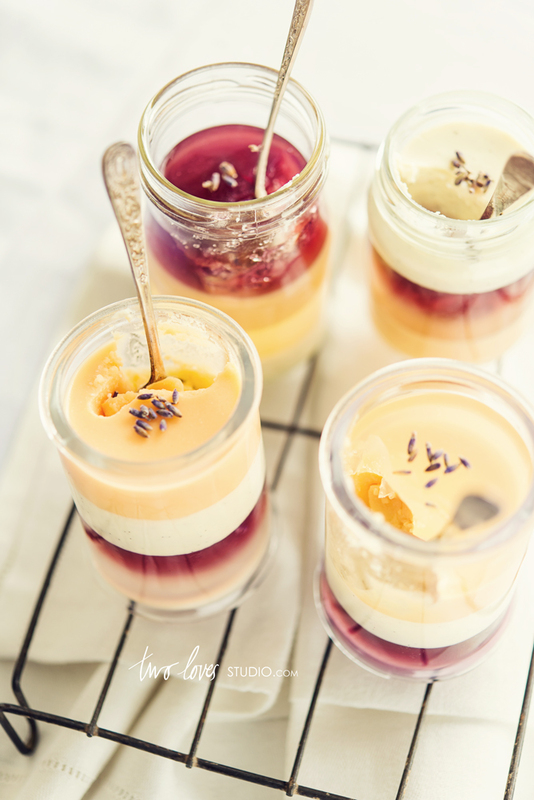 Garnish with culinary lavender or other edible flowers you have on hand. To set gelatin correctly, the directions and quantities must be exact. Read the specific directions on the gelatin package and make any necessary adjustments. As this recipe allows you to create the base for each gelée, mix in whilst warm the specific quantities list on gelatin package.